Like any good Techno producer, Moscow electronic producer Harry Light envelops his stage image by a veil of mystery, preferring to communicate with his audience exclusively through the music. It's more than enough in his case. Harry Light's music is artsy and ascetic. There's nothing superfluous and it sounds extremely good, the louder the better revealing it's great potential. Regarding Harry's stylistic range, it extends from well recognized German Techno and minimalistic Deep House to Dub and Deep Techno. It also can be easily read by the label names where Harry's music being released. There's Anton Kubikov's iconic label Pro-Tez, Highway Records sub-label What's In The Box and trendy young imprint Electronica. Important addition to this list will be a release on Kiev vinyl label Artreform. 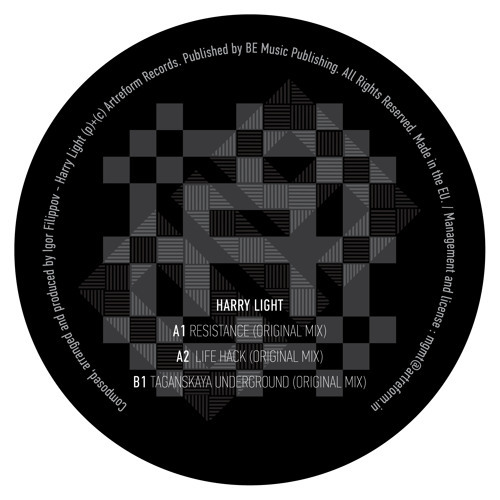 On this new release titled 'Resistance' Harry Light has managed to show all the best sides of his eclectic sound. Early support from Shinedoe, Slam, Echologist, Rhadow, Pig&Dan, Satoshi Fumi, James Zabiela, Noah Pred and many more!